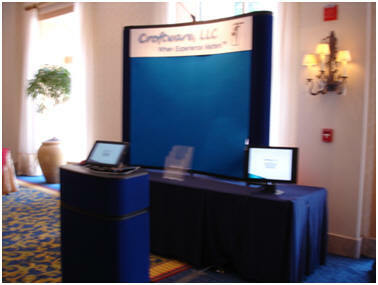 NET Income has a complete trade show kit including booth, podium, lights, computer, projector and other essential materials for a successful, professional trade show exhibit. This exhibit is available to you for special occasions. The staff of NET Inc. will assemble the exhibit and staff the booth during the show on your behalf. Contact us for additional details. This booth can be put to work for you. 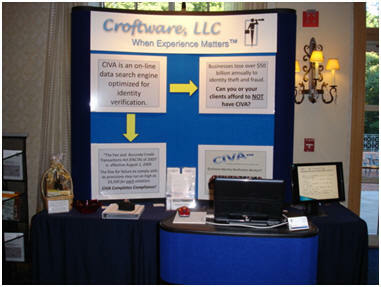 Your cost would also include the rental cost of the exhibit space. This is typically $500-$1,500 for a 10' x 10' space, depending on the show host, duration of the show, and number of attendees. Add the cost of electric service if you use a computer or lights. The exhibit cost for shows outside the northern Virginia area would also include airfare, hotel, and per diem costs for the duration of the show, plus 2 days, for one person. For shows running 3 or more days, add a support costs for a second staff person.